Ars Technica and GOG are offering a “few hundred thousand” copies of The Witcher: Enhanced Edition for free on Mac/PC. 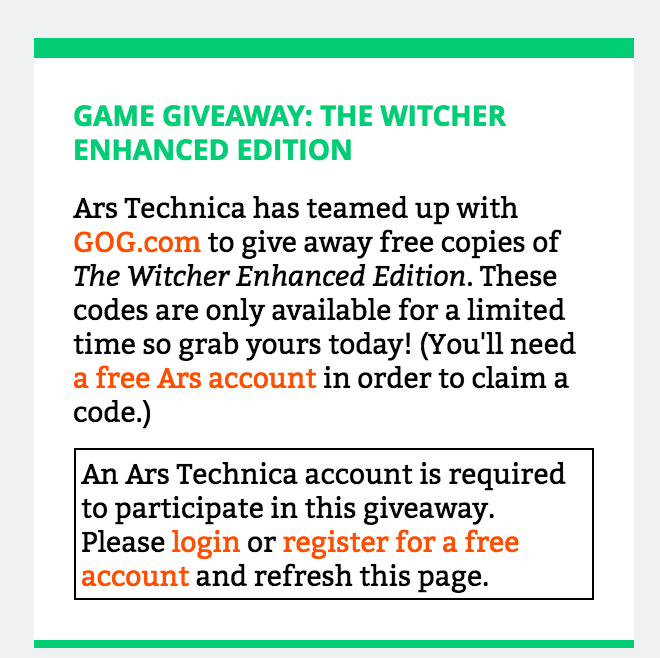 You’ll have to make a free Ars Technica account, and then hit the CLAIM THE CODE button on this page. You’ll find complete directions below. The game that started the stellar Witcher Trilogy regularly sells for $9.99 on GOG. You’l have until the end of the day on Thursday or until supplies run out (GOG decides to shut it down). Suffering from amnesia you remember nothing of your past. Kaer Morhen, the last remaining keep of the witchers, was attacked by a mysterious organization, just as you were starting to lick your wounds there. Today’s Best iOS/Mac App Deals…. Today’s Best iOS/Mac Game Deals…. Today’s Best Console Game Deals….